Its been a really really long time since I posted a recipe. In fact, quite a long time since I did some serious cooking. 1.5 years to be precise. So I decided to start off with something really light to get things going. And for me, eggs are the easiest to get the rusted cooking hands and head moving, so picked off some ideas from tip hero and modified them to my liking. First shred the potatoes. I used the cheese grater and got them ready cut like hash browns. Wash them nicely in water. These seemingly useless steps are very important to get them to cook well, so do wash them twice or thrice till the water is no longer cloudy when you wash them. The next step is to get them as dry as possible!!! 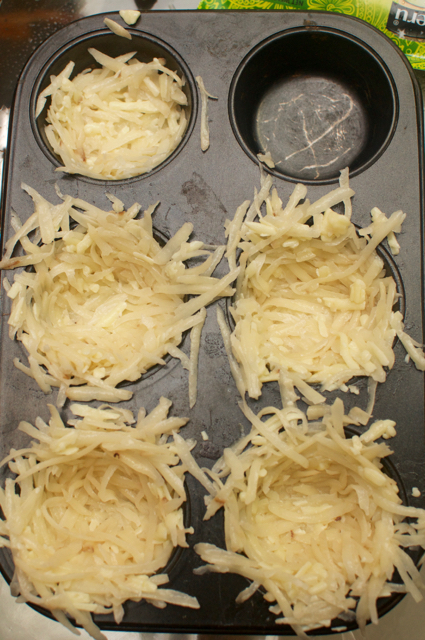 Mix the potatoes and the cheese, add some salt and pepper and stuff them into muffin trays with space in the centre as shown. No need to butter the trays if you have the right amount of cheese. Bake them in a preheated oven for 15-20 minutes at 175 degrees till they are nice and light brown. 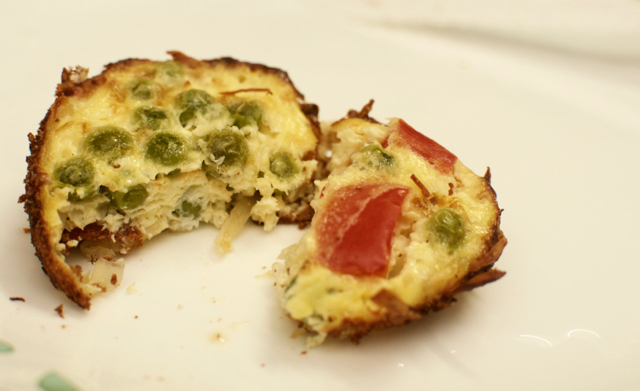 While the potatoes are browning, beat the eggs with buttermilk and add the bell peppers and green peas to it. Mix well. I used Amul Spiced buttermilk, so I didn't have to add salt or pepper, but feel free to spice the buttermilk the way you want and adjust the final salt and pepper accordingly. 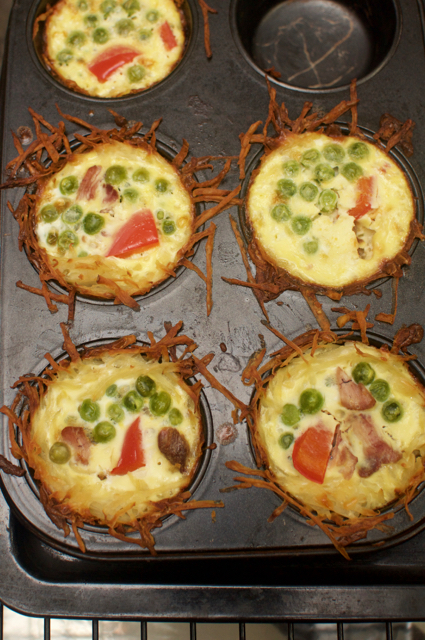 When the potatoes are ready, pour the egg mix into the six muffin potato baskets and bake again at 175 degrees for another 15-20 mins or till the eggs are cooked through. This is when I would get ready myself and get all dressed up! 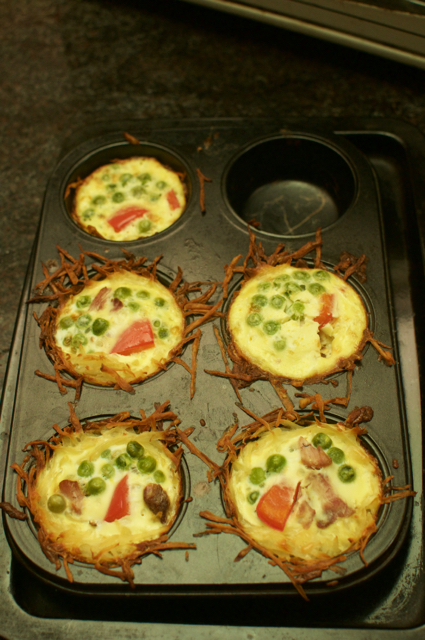 Leave for a few minutes and take them off the tray when you get back and smell the wonderful aromas! 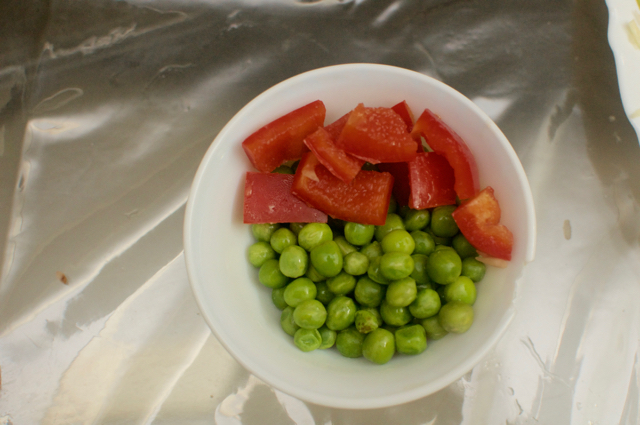 Simple, yet nice and healthy breakfast ready while you are doing the same.